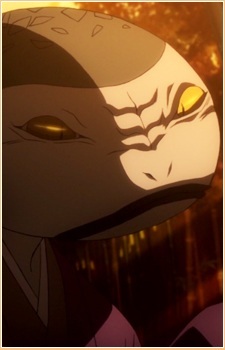 A yokai who looks like a scaly humanoid with a snake's head who can elongate his neck or turn into a large snake. Though he exchanged Sakazuki with Zen, he claimed that he only followed Zen because he was the easiest ride to the top. After Zen met with Rikuo and learned that he had no intention of succeeding Nurarihyon's position, Hebidayu turned against him. Along with several like-minded subordinates, he burned down the Zen Sect's house and tried to kill Zen, but was defeated and sliced in half by "Night" Rikuo.